Within military organizations, the act of raising colours is used as a symbolic gesture for standing your ground or a rallying cry. The battle that we fight isn't in some distant land, but in our garage; our mission is overcoming the obstacles put forth in the build we lay out. The Stance|Works Garage banner is a symbolic representation for all enthusiasts who choose to take on that battle when the opportunity presents itself. It is for those who take pride in not only being an automotive enthusiast, but possess a willingness to go above and beyond in their automotive endeavors. In that, we offer you Stance|Works Garage banner. Stand proud and raise it high. Each heavy duty Vinyl banner measures out to 96 inches wide X 22 inches tall, with each edge double hemmed for reinforcement and 8 grommets running the perimeter for ease of placement. 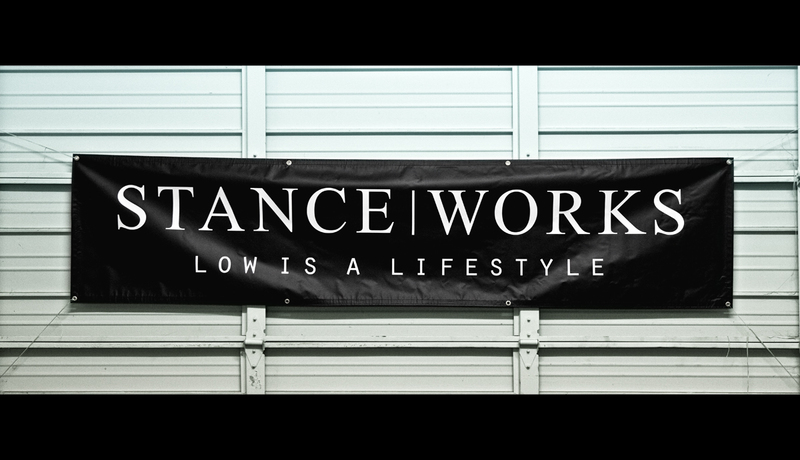 For more information and to purchase click the Stance|Works Garage Banner.